This is a super simply recipe that you can enjoy with or without Indian food. 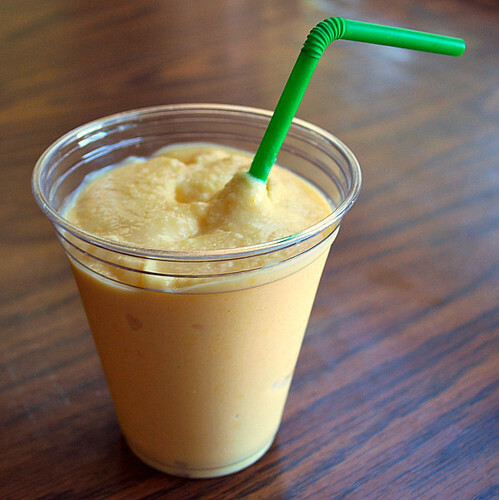 A straightforward combination of fresh mango, yogurt, honey and a splash of milk are blended together. I also added some mango pulp for an extra boost of flavor and color. Mango pulp can be found at various ethnic markets in the frozen section or even canned. If you can't find mango pulp, you can substitute the milk for mango juice or add an extra mango for additional flavor. Peel the mango skin, discard seed and cut the mangoes into small pieces. Combine all the ingredients in an electronic mixer or blender and blend well. Make sure the mangoes are completely blended into juice. Adjust the ingredients as per your taste, pour into glasses, and serve immediately.